The Wood Design & Building magazine has announced the award recipients for the prestigious 2015/16 Wood Design Awards program. Winning recipients were hand selected from over 140 online entries by an esteemed architectural jury. Special awards were granted by the Canadian Wood Council as well as this year’s sponsors, Sustainable Forestry Initiative and Western Red Cedar. Projects submitted to this year’s awards program pushed the boundaries of what is thought of as conventional applications for wood products – reaffirming wood’s versatility within construction. Both the International and North American projects displayed a well-articulated understanding of old and new techniques for wood in architecture. – Fort McMurray International Airport, Fort McMurray, Wood Buffalo, Alberta, office of mcfarlane biggar architects + designers inc. Project commenced as predecessor firm mcfarlane green biggar Architecture + Design Inc.
– MEC Head Office, Vancouver, British Columbia, Proscenium Architecture + Interiors Inc.
– Fire Station 76, Gresham, Oregon, Hennebery Eddy Architects, Inc.
– Quilakwa Center, # 5655 Highway 97A, Enderby, BC, KH Design Inc.
A video on the award winners is available for viewing. 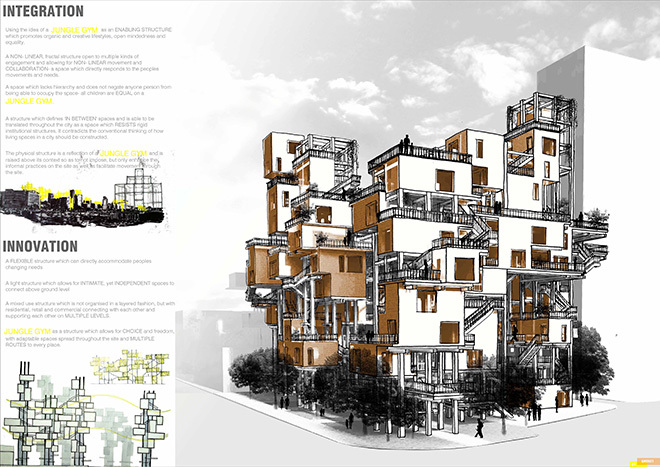 The winners of the TREEHOUSING International Wood Design Competition were recently announced at the XIV World Forestry Congress in Durban, South Africa. Housing for the world’s growing urban population and the threat of deforestation are two of the most significant issues facing humanity today. The competition challenged architecture students, professional architects and engineers around the world to develop innovative wood housing and affordable urban building solutions for Africa and beyond. Entrants were required to use any sustainably harvested wood material or product as the primary material for their designs. For more information and to view the complete list of winners, visit the TREEHOUSING website. Vancouver-based GBL Architects have taken second place in Portland’s AIA annual international design competition, entitled Stitch II. GBL have named their scheme “Entwine” to describe their efforts to adapt and reappropriate existing marginalized sites within city centres, in the context of limited expansion opportunities within our increasingly densifying urban cores. The linear arrangement of vacant lots below the 405 bridge in downtown Portland present a series of impermeable spaces that in their existing state contribute little to the connection between the adjacent Alphabet Neighbourhood and Pearl District. For additional information on the Portland AIA competition and GBL Architects. This year, the Ontario Association of Architects (OAA) has awarded the Order of Da Vinci to Leslie M. Klein for his leadership and profound relationships within the profession and the community at large. Mr. Klein, a member of the AIBC between 1994 and 2010, received the award in recognition of his significant and meaningful contributions to the profession. Congratulations to Maura Gatensby, Architect AIBC, Practice Advisor at the AIBC, recipient of the Building Officials’ Association of BC (BOABC) Jim Robison Award. The award was presented at the 60th Annual BOABC conference held in May 2015. The Jim Robison Award was given in recognition of Maura’s contributions, on behalf of the AIBC, to building code education throughout many code changes and in particular the 2012 BC Building Code 9.36 Energy Efficiency and 9.32 Ventilation amendments that came into effect December 2014. The Jim Robison award honours a member of the association or a member of the building industry for significant contributions to the code development activities and goals of the BOABC. The award is not presented annually as it is given only when notable achievement warrants exceptional recognition. On Wednesday, March 12, 2014, the City of Nanaimo honoured four recipients in the cultural and creative fields at the City’s annual Cultural Awards Celebration, including Ian Niamath Architect AIBC. The City’s Cultural Committee selected this year’s honourees based on each individuals significant contributions to Nanaimo’s cultural vitality. Candidates were identified through a community nomination process. Two new award categories were created this year; Emerging Cultural Leader and Lifetime Cultural Achievement. The four awards recipients include: Shayd Johnson; Kenneth Gogo; Pat Coleman and Ian Niamath Architect AIBC. Ian Niamath will receive The Honour In Culture Award for his many years of volunteer service and support for the arts and cultural sector including the Nanaimo Art Gallery, The Nanaimo Dragon Boat Festival and for his design / architectural work on many of Nanaimo’s building projects- most notably Nanaimo’s waterfront and renowned Harbourfront walkway. Andreas Kaminski Architect AIBC, aka architecture + design inc. – Red Sky Townhomes, Whistler, B.C. Mike Mammone Architect AIBC, Ratio Architecture – Interior Design – Planning – Salmon Arm Savings and Credit Union – Uptown Branch, Salmon Arm, B.C. James Tuer Architect AIBC, JWT Architecture and Planning – Forest House, Bowen Island, B.C. Dave McIntyre Architect AIBC, David Nairne + Associates Ltd. – Yunesit’in Health Centre, Hanceville, B.C. Jennifer Marshall Architect AIBC, Urban Arts Architecture – T’it’q’et Community Hall + Health Centre, Lillooet, B.C. Alfred Waugh Architect AIBC, Formline Architecture + Urbanism – Liard River Hot Springs Facility, Liard River, B.C. Peter Busby Architect AIBC, Perkins + Will – Earth Sciences Building and Centre for Interactive Research on Sustainability in Vancouver; the Brentwood; Gilmore Skytrain Stations; Kingsway Pedestrian Bridge. Gerald Epp P.Eng., Fast + Epp Structural Engineers – Bow River Bridge, Banff, Alberta. Gord Macdonald, Macdonald & Lawrence Timber Framing – WildPlay, in Kelowna, B.C. John Wall Architect AIBC, PUBLIC: Architecture + Communication – Centennial Beach Boundary Bay Regional Park Pavilion in Delta, B.C. Peter Busby Architect AIBC, Robert Drew Architect AIBC, Perkins + Will – Samuel Brighouse Elementary School, Richmond, B.C. Karen Marler Architect AIBC, Hughes Condon Marler Architects – UniverCity Childcare Centre, Burnaby, B.C. Wood WORKS! is a national industry-led initiative of the Canadian Wood Council, with a goal to support innovation and provide leadership on the use of wood and wood products. US-based ZGF Architects and local firm Cotter Architects come together to form ZGF Cotter Architects, the award-winning US firm’s first office outside of the United States. The new firm will build on Cotter Architects’ established presence in the local market and allow ZGF Architects to provide the exceptional level of design service for which the award-winning US firm is widely recognized. The new firm will go forward under the leadership of Principal Patrick Cotter, Architect AIBC, with ZGF Partners Jan Willemse, AIA and Allyn Stellmacher, AIA, and Operations Director Bonnie Cotter. The Canadian office expands ZGF’s network of five existing offices in Portland, Seattle, Los Angeles, Washington DC, and New York. Winning in the Residential (Townhouse) category: Currents at London Landing developed by Oris Consulting Ltd. and designed by Hearth Architectural Inc. and van der Zalm + associates. The higher density building form fits well into an established neighbourhood and streetscape of townhouses and single family homes and includes single level units which increase housing options by providing an alternative to apartment uilding units. Winning in the Residential and Mixed-Use (High-rise) category: River Green developed by ASPAC Developments Ltd. and designed by James K.M. Cheng Architects Inc. and Phillips Farevaag Smallenberg Studio. This stunning development sits on the banks of the Fraser River in the Oval Village. Terraced residential apartment buildings vary in height from 4 to 14-storeys, with carefully-considered architectural and landscape design and a significant public art installation on the sides of a pedestrian bridge between two of the buildings. Winning in the Public and Institutional Building category: Steveston Fire Hall designed by Hughes Condon Marler Architects and space2place design inc. This landmark building sits at the corner of Steveston Highway and No. 2 Road. The two-storey fire hall project was designed to a LEED gold standard and includes two equipment bays and a training and hose drying tower. The building was designed with an innovative open design approach incorporating visual openness and a high level of integration in the site, building, sustainability features, landscaping and public art. This year’s judging panel included three independent judges – landscape architect, Mr. Jeff Cutler, BCSLA; urban designer, Ms. Joyce Drohan, Architect AIBC, and architect Mr. Michael Heeney, Architect AIBC, FRAIC, as well as City judges Mr. Joe Erceg, General Manager of Planning and Development; and Mr. Wayne Craig, Director of Development. Michael Geller Architect AIBC, FCIP, RPP, President of The Geller Group and Adjunct Professor of the SFU Centre for Sustainable Community Development, is headed to Moscow shortly. While in Russia, Geller will serve as the only North American invited to sit on International Financial Centre Competition jury. To learn more about the competition and to view the full jury listing, click here. Vancouver took top honours at the World Green Building Council’s Government Leadership Awards, earning the citation for Best Green Building Policy. Held in partnership with the International Council for Local Environmental Initiatives (ICLEI) and the United Nations’ UN-HABITAT Human Settlements Program, the biennial award program recognizes local government leadership in green building and highlights policies that maximize the opportunity for buildings to mitigate environmental impact. Vancouver was singled out for its Greenest City 2020 Action Plan, which calls for a 20% decrease in greenhouse gas emissions by 2020. Winning cities were chosen by an expert panel of judges representing ICLEI, UN-HABITAT, and the World Green Building Council. The winners were announced at the Warsaw Dialogue on Scaling-Up Local and Subnational Climate Action, held in conjunction with the UN Climate Change Conference in Warsaw, Poland. For more information, click here. A group with Vancouver representation is among the six finalist teams chosen in the final phase of the Canadian National Holocaust Monument competition. The two-phase national competition invited teams of architects, artists and other design professionals from around the globe to develop design concepts for the National Holocaust Monument to be built in Ottawa. The B.C.-based contingent includes Hossein Amanat Architect AIBC and Robert Kleyn Architect AIBC, along with University of Toronto Associate Professor David Lieberman OAA AAA MRAIC RIBC, landscape architect Daniel Roehr and artist Esther Shalev-Gerz. The monument is intended to honour victims and survivors of the holocaust and ensure a permanent place in the national consciousness and memory. Final project designs will go before the competition jury this early in 2014. The Association of Professional Engineers and Geoscientists of British Columbia (APEGBC) celebrated its 2013 President’s and Project Awards on October 25, 2013 as part of its annual conference. Amongst the recipients was AIBC Honorary Member Paul Fast P.Eng Struct. Eng., of the Vancouver-based engineering firm of Fast + Epp , who received the R.A. McLachlan Memorial Award, APEGBC’s premier award for professional engineering, recognizing those who have made significant technical, professional service and community service contributions to the engineering profession.